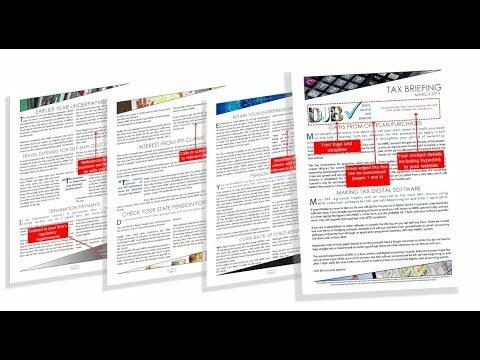 The four quarterly newsletters can start at any edition in the year. Most firms have realised that producing and distributing a client newsletter, while useful, takes too much time if it is to be as professional and relevant as the firm it represents. The PTP client newsletter allows you to email your clients a newsletter each quarter along with budget specials, badged and branded with your firm’s details. With over 25 years of keeping advisers and their clients up to date with the key news, tips and observations in UK tax, we are perfectly positioned to produce a newsletter relevant to individuals and small business owners and directors. All newsletters are written in easy to access language for clients not advisers and include calls to action to help firms generate leads and increase fee earning potential. Alternatively, the same content can be copied into your website news sections to help direct traffic to your website and, hopefully, click throughs to other services offered. For more information contact us or click 'SAMPLE COPY' below to read a recent quarterly newsletter along with details of how it will be moulded to represent your firm and help you help your clients. For details of how to purchase - see the order form below.